I'd like to send out a HUGE thank you to everyone who participated in my Summer Time Give Aways. I hope you all had an incredible summer filled with sun, family, and lots of great memories (some of which I hope included some good books!). 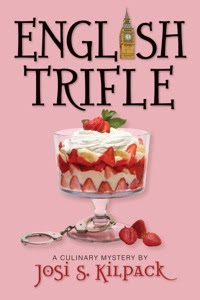 Also, I'd like to thank Josi Kilpack for donating a copy of this week's prize - her new release, English Trifle! And, the very last winner of the 2009 Summer Time Give Aways is . . .
Connie, please send me your mailing address so I can forward it on to Josi. Congrats!!! Yahoo! I'm sure Connie will be so excited. Congratulations, Connie. Thanks for the fun contests, Danyelle. And congrats to Connie!